Southampton's Luke Shaw is set to win his first England Under-21 call-up for next month's Sweden friendly, according to manager Stuart Pearce. The 17-year-old has been a revelation for Saints in the Premier League this season and under-21 boss Pearce says he is a huge admirer of the full-back. "I think Luke is an outstanding talent," Pearce told BBC South Sport. When asked how far off a call-up he was, Pearce replied: "Probably about two weeks away." 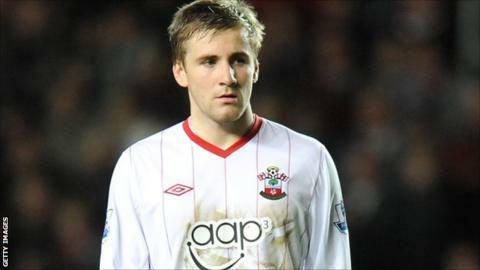 Shaw has attracted the interest of Arsenal and Chelsea following his performances for Saints this season, but he committed his long-term future to the club last week. Appearances: 13 Premier League, 1 FA Cup, 3 League Cup, 6 England under-16, 8 under-17. Pearce, who won 78 caps for his country, has been keeping a close eye on Shaw's progress and has been hugely impressed with what he has seen. "I've seen a fair bit of him over the last month or so," Pearce continued. "I'll be down on Monday to watch the game against Everton, I was there on Wednesday night against Chelsea also. I don't think I've seen him play badly in all the games I've seen of him. For a 17-year-old playing at that standard that's quite impressive." With call-ups for James Ward-Prowse and Calum Chambers into the under-19 squad, Pearce paid tribute to the Saints academy which has also produced Theo Walcott and Alex Oxlade-Chamberlain in recent years. "They are in the Premier League but the manager is quite happy to put the likes of Ward-Prowse and Luke in the first team and credit to them for doing that. "I think it will bear fruit, certainly it has with Luke, and it will again in the future. Southampton have got a real reputation of bringing talent through." Pearce, who was speaking at Sholing FC as part of England team sponsor Vauxhall's Youth Programme initiative, also hinted that full honours for Shaw would not be out of the question. He said: "I'd like to keep him with me for a little while. "But we've shown in English football recently if you're good enough, there are a lot of young players who have made an impact in the Premier League who have gone on to make senior England international appearances.